His designer suits and expensive car project an image of success, but Salah Messikh has been on the brink of bankruptcy for more than a year. Messikh, the founder of one of Poland’s oldest halal slaughterhouses, saw his revenues halved because of a 2012 court ruling that rescinded a government regulation exempting Jews and Muslims from a requirement that animals be stunned prior to slaughter. The ruling shut down Poland’s $500 million kosher and halal meat industry last year. For the activists who petitioned the court, the ruling was an important victory in their fight for animal rights. But for the Algeria-born Messikh, it paralyzed a production line he has spent 10 years and a fortune building. Messikh now struggles to resell meat imported from Romania, where ritual slaughter is permitted. The high costs and low quality, coupled with Messikh’s insistence on continuing to pay 20 staff members whose services he no longer really requires, have pushed his business to the brink. When Poland joined the European Union in 2004, it had a minuscule industry of ritually slaughtered meat. Nine years later the country had emerged as one of the EU’s leading exporters, with 273,000 tons produced annually, of which approximately 20 percent was kosher and 80 percent was halal — nearly all of it for export. Before the ban, ritually slaughtered meat accounted for approximately 30 percent of all Polish beef, lamb and poultry exports, according to the Polish Meat Association. With the industry now in ruins, Poland’s share of the kosher and halal meat market is being carved up by competitors, leading to frustration and conspiracy theories among some local producers and politicians. Marcinkiewicz said the consortium, based in a country that many Poles have historical reasons to distrust, had given itself two years to achieve the liquidation, but managed to reach the goal in just six months while spending only a fifth of its budget. He would not say how he obtained this information or name the parties involved, but his statement was seen to suggest that foreign meat producers were bankrolling the fight by Polish animal rights activists and enlisting the support of Polish lawmakers. Marcinkiewicz’s is not an uncommon view in Poland. Agriculture Minister Stanislaw Kalemba said in a radio interview in July that “foreign powers were trying to take over the Polish meat industry.” According to the radio station, he named France in an earlier interview, an allegation denied by the French Embassy in Warsaw. Such speculation is bolstered by the adverse economic impact of Poland’s decision. In a country with an unemployment rate already three points higher than the EU average of 10 percent, outlawing ritual slaughter spelled joblessness for thousands. Given the costs to local producers, economists expected Polish lawmakers to vote to legalize the industry. But a bill reversing the ban failed in the Polish parliament, in part because of coalition lawmakers who unexpectedly voted against their own party. If France and Germany did manipulate the Polish vote, their meat industries do not seem to be profiting from it. In France, which produces 25 percent of the union’s beef, rates of ritual slaughter were unchanged in 2013, accounting for 14 percent of total meat and poultry production, according to the French Ministry of Agriculture. Overall, French production was down 10 percent in 2013, most likely to due to France’s role in a European horse meat scandal. A similar decline was observed in Germany. The beneficiaries of the Polish ban have been in Eastern Europe. One month after the ban went into effect, Romania signed a contract for the delivery of tens of thousands of tons of halal meat to Jordan, a country that once imported much of its meat from Poland. Romanian poultry production increased by 57 percent last year. Beef production was up 18.2 percent. In an interview with JTA last month, Romanian President Traian Basescu said his country would continue to resist EU demands for restrictions on ritual slaughter. Other smaller European countries also are trying to capitalize on the market gap created by the Polish ban, including Croatia, whose chamber of commerce in July invited 19 Muslim ambassadors for the opening of a special department specializing in halal meat exports. And in Lithuania, the meat lobby is backing legislation submitted in October that proposes to lift restrictions on ritual slaughter. “We have lot of good beef and it is very important to have possibility to supply it to halal and kosher consumers,” Egidijus Mackevicius, the director of the Lithuanian Meat Processors Association, told JTA. Back in Poland, some business owners still hope that legal action by Jewish and Muslim communities will succeed in reversing the ban. 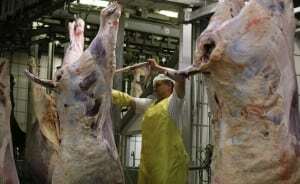 Malgorzata Podniesinski, whose family owns a slaughterhouse near Warsaw that once specialized in halal and kosher meat, said her business has dropped by 70 percent, requiring her to lay off about half her staff. But if the ban is reversed, Podniesinski believes the business can still be restored.